Osteoarthritis of the knee is the cause of significant pain and disability. Many people do not clearly understand what osteoarthritis is. Your doctor may have said, “It’s just osteoarthritis”. That’s all well and good, but your knee hurts, and you do not know what your next steps are. 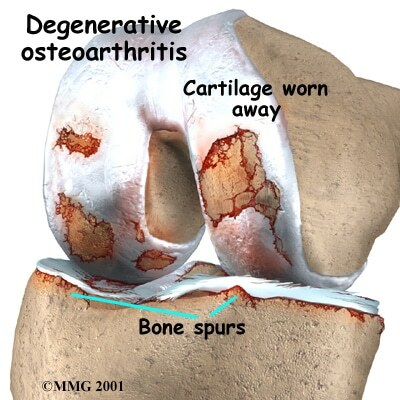 Osteoarthritis is, by definition, a loss of cartilage. When our knees were normal we have a healthy thick layer of cushioning or cartilage covering the bones of the knee. Our cartilage can wear thin over time, even without any specific injury to a joint. 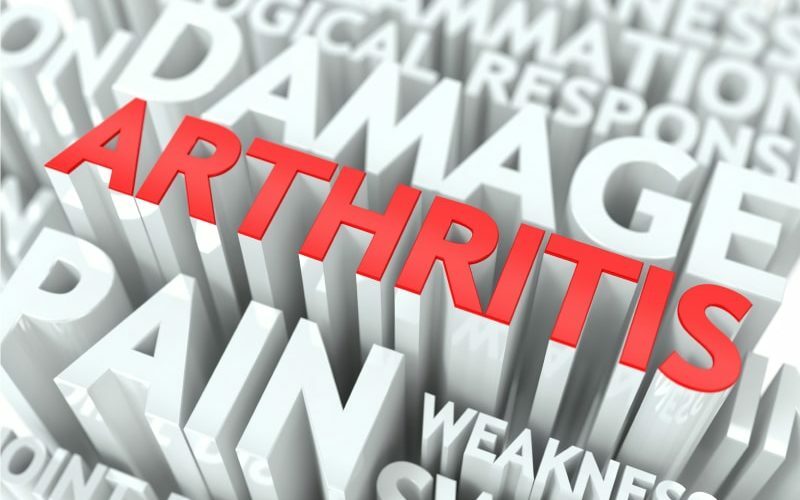 The most common causes of arthritis include genetics …. do your parents have it? Knee joint arthritis can also be caused by previous injuries, previous surgery, meniscus tears, ACL tears, and other more rare diseases. The pain due to Osteoarthritis is caused by inflammation. Therefore, managing the pain of osteoarthritis is all about managing the inflammation. A significant number of people suffer due to the pain of Osteoarthritis of the knee. Many people with knee pain due to arthritis are told that they require knee replacement surgery. Because of fear about the complexity and risk of knee replacement surgery and the potentially significant pain and downtime involved, most knee arthritis sufferers are searching for information on how to manage knee arthritis pain without surgery. While knee replacement surgery may be necessary years or decades down the road, there are many treatments available which can usually give you relief of pain and often return you to an active lifestyle. 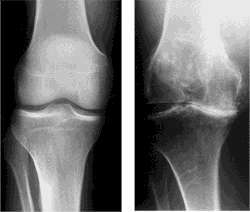 With Osteoarthritis, there is a progressive loss of cartilage within the knee. It typically takes years to occur, but arthritis eventually reaches the point when the two bones composing the knee are touching one another … a situation most of us refer to as being “bone on bone.” Some people can remain very active despite x-rays which show bone on bone arthritis, yet many others suffer significantly. Why? The reason is inflammation. Some people with arthritis have much more inflammation than others. We are not sure why that happens. Osteoarthritis is an inflammatory condition. It causes inflammation of the soft tissue that lines our knee joint– a process we term synovitis. It is the inflammation of the synovium or the lining which produces most of the pain. A very promising recent (2018) non-surgical treatment for arthritic knee pain is called a selective arterial embolization. If your knee pain has failed to improve with other more common treatments it is worth reading our article on it. Most of the other methods we use to treat osteoarthritis of the knee are geared towards decreasing the amount of inflammation within the knee. Many of the treatments we discuss will minimize your discomfort and improve your function. Injections: Hyaluronic Acid (Gel) Injections. Bracing: Specifically “unloader” type braces. Selective arterial embolization: see below. Most patients with osteoarthritis eventually start taking Chondroitin Sulfate. There was a recent paper which demonstrated that Chondroitin Sulfate performed well at minimizing the pain due to osteoarthritis. Many other scientific studies show mixed effects or benefits … but a recent roundtable discussion amongst fairly prominent Orthopedic Surgeons found them discussing that they suggest it to most of their patients with arthritic knee pain. Tart Cherry Juice has a fair amount of research behind it showing that it is effective at decreasing the inflammation associated with arthritis and thus improve your quality of life. Tart (sour) cherries have high levels of anthocyanins, which have anti-inflammatory and antioxidant effects. Compression sleeves improve the pain and stability of a knee stricken with osteoarthritis. It has been proven that people with arthritis are more comfortable with a knee sleeve. The exact mechanism is unclear. It is likely due to an increase in proprioception – it is not because you put a very tight sleeve on! Purchase a size that fits well and stays on. Many of my patients enjoy wearing the Tommie Copper brand. It fits well, is well tolerated and stays in place over the course of the day. Others find brands like Bauerfeind provide even more compression and stability. Plenty of research studies have now demonstrated that PRP injections will decrease the inflammation in the knee due to osteoarthritis. Furthermore, very recent studies show that PRP injections might actually slow the progression of arthritis. That means that PRP injections might stop the gradual loss of more cartilage in the knee. The main issue with PRP injections is that we still need to determine exactly which way to prepare it is best, how often it should be given and we need the insurance companies to buy in since they do not cover it and it will be a cash outlay for you. When we perform PRP injections we take a sample of blood and prepare it in a centrifuge. We then inject a portion of that blood back into the knee. Within a few days to a few weeks, most of you are feeling better. In general, the more severe your arthritis, the less effective the PRP might be. An important side note. Just because one doctor charges $4000 and one charges much less does not mean the expensive version is better. Pricing in healthcare is like the wild west. Go with the physician you trust most. Most arthritic joints like to move. People who are able to walk on their arthritic knees actually are more comfortable than those who do not. Arthritic knees also respond well to physical therapy guided by a professional. That’s why many of you notice that the pain is worse immediately upon arising but that the knee joint loosens up and starts to feel better after a few minutes of walking or stretching. The fear of making arthritis worse should not stop you from taking your daily walk. The research in this area is very clear. Exercising will not make your knee arthritis worse. Quite the opposite, for many it helps you delay more invasive treatment options for many years. Laying around or staying on the couch is the worst thing that you could do for your overall health and well being. A lot of research has shown that walking and light resistance exercises work well when trying to manage the pain in your knee. In July 2017 we posted an in-depth article on how a selective arterial embolization procedure works to eliminate, or significantly reduce arthritic knee pain for up to 6 years. We have been very pleased with the results of this procedure. Most all of the patients who have had the procedure are no longer having significant pain, and are no longer taking medications or using their braces. Do I need surgery for my knee arthritis? If all of the above treatment alternatives fail, and your quality of life is miserable, then it may be time to consider other surgical strategies such as a full knee replacement or a partial knee replacement. For many, they are very successful procedures. For some, they are not very successful. This is a quality of life decision. Do not let anyone tell you that you must have a knee replacement. You should be the one requesting it.